When parents think about signing their kids up for karate, most often they are really looking for their child to be more focused, confident, have more self-esteem, believe in themselves, be stronger both mentally as well as physically, set goals and reach them.. the list goes on. The Black Belt Excellence program shows parents that you really do actually teach more than punching and kicking. They can actually see those benefits of martial arts, those character building life skills, being taught to their children. Find out why we are trusted to help deliver the character building life skills that go with martial arts training to over 10,000 kids. Our program is the BEST character building life skills program for martial arts schools. You are so busy. Running a school is lots of work. Our system takes out all the guesswork involved in planning life skills lessons for your students. I am sure you promise every parent that signs up that their child will learning more than just punching and kicking. Now you can be confident you are clearly, professionally delivering on that promise! The students are taught the lessons during class, they read and complete their newsletter, they earn their dog tag necklace reward and then have their newsletter returned to them to keep and review the lessons at home. This is a solid, concrete system to teach life skills. We provide you with the high-quality, professional 4 page newsletters to give to your students. We provide you with the motivational tag necklace reward system. We tell you exactly what you should be discussing with your students during your mat chats end of every class. You have 24/7 support in our online member's only group. Our system is easy for your instructors which makes them far more effective when teaching the lessons! It can seamlessly integrate into any school immediately and works for ALL age groups from little dragons on up through teens! With our weekly mat chat videos, your staff will be teaching something new each week during the mat chat at the end of every class. Students must attend during each lesson in order to complete their monthly assignment! We provide you with 3 weeks of lessons each month - you use the 4th week for review. The majority of schools pass out their dog tag necklace rewards during the 4th week. This ensures that your students make it to class every week of the month! Students get EXCITED about earning their rewards and will not want to miss their chance! Once students earn their necklaces they are eager to show them off!! They will wear them everywhere they go opening up a conversation between them and their friends about your school! We all know the very best advertising is word of mouth! Students who are old enough for social media always post a pic of them wearing their tag on their snapchat & instagram too! WHAT'S INSIDE YOUR MONTHLY KIT? 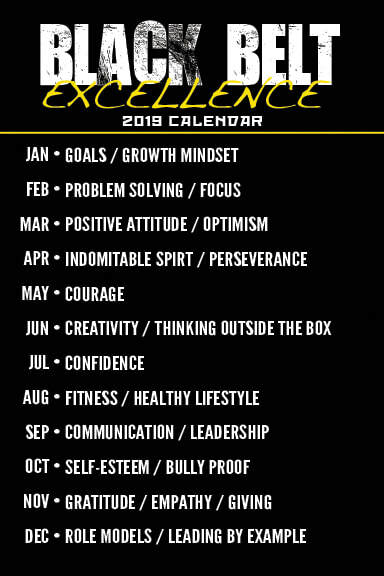 Each month get excited for your Black Belt Excellence Kit to arrive! It has all the supplies you need to provide your students with the BEST life skills curriculum! Need more than 50 newsletters & rewards? No problem! We can upgrade your kit to include as many as you need! Joining now also comes with all of the following bonuses!! Mat Chats & Drills - We tell you exactly what to say to your students each week to teach them the lessons! Each week's video also includes drills you can do in class to reinforce the monthly lesson! Our mat chat videos are all done by Grandmaster Greg Silva, martial arts business expert! Digital Version of the Newsletter - You will have the ability to download the entire newsletter! Email it out to prospects as well as students who you have lost over time! Poster - Print and hang up the poster in your school to keep your students focused on the lesson! Facebook Ad - Coordinate your Facebook marketing with the monthly lesson! We provide you with a new Facebook ad each month and even write the copy for you too! ​OH AND LET'S NOT FORGET..
​You will also have access to our Facebook group! You and your staff will not only be able to easily access the mat chat videos and other important information we have to share with you, but you'll be able to network with other schools using the system!